Purchasing a home has been perceived as a man-driven affair for quite a long time now. But in recent years, there has been a paradigm shift in the home buying patterns in India. Women have started establishing a path of their own and are becoming more financially independent. 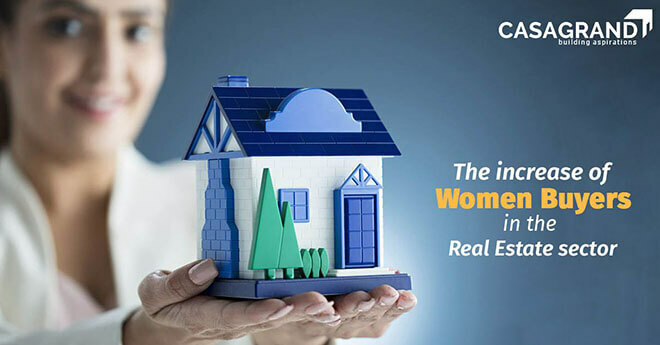 Interestingly, there was a time when women were only entitled to own their ancestral home but times are changing and women have started investing in real estate properties for several reasons. Firstly, to have a place for themselves which is in close proximity to their workplace. Secondly, whether they are Indian residents or NRIs, women are also purchasing a property in an effort to diversify their investment portfolio. Men of the household have always been viewed as the sole decision maker and the women’s say in important matters such as home buying were never brought to light. But there has been a radical change in family decision making where women’s opinions are being valued and given notice. This rise in trend is due to the financial stability and independence that the women of our country have acquired over time, especially in metropolitan cities like Mumbai, Chennai, Bangalore and Hyderabad. According to a recent report, 74% of the all the real estate purchases are influenced by women and 32% of the home buyers are single women. These facts clearly indicate that there is so much potential within this segment of the population. Developers and real estate groups must take immediate notice and provide female investors with incentives in order to grow their own business and also alleviate gender parity in our country. Read on to know more about the incentives that our country is offering to the women home buyers. Women can reduce their taxable amount for property tax up to Rs. 1.5 lakh if the property is for self-use. In case of property co-owned by the man and the wife, the tax is deducted in equal proportion. Apart from this, if the property is rented, then the interest on the home loan can be deducted from the net rental value. Women can also enjoy the benefit of paying lesser stamp duty than men. It is usually one or two per cent lesser than what men are obliged to pay. However, this rate varies from state to state. For example, in Delhi, the stamp duty for men is 6% while its only 4% for women. In Haryana, it’s 6% for women and 8% for men. You can also save a significant amount if the property is registered in the name of the female partner as the stamp duty is lesser in such cases. The Pradhan Mantri Awas Yojana (PMAY) was introduced with an objective to encourage home ownership amongst women in both urban and rural areas. The PMAY guidelines state that it is mandatory to make the female member as a co-owner of the house. Women who are seeking home loans can also get a concession on the interest rate under the PMAY scheme. This is the prevailing rate as of June 20, 2018. This is applicable only for a loan amount less than Rs. 1 Crore. There is no better time to buy a home than in 2018 for all the womenfolk of the country. It is the best way to ensure financial stability and secure your future. Make a smart investment with Casagrand for our superior quality construction and stunning aesthetics. If you are first time home buyer, you can check out our blogs on common real estate investing mistakes to avoid and all you need to know about registering your new property.